Platteville, Wisconsin — Don Austin just likes trees. Over the past 30 years the veteran dairy grazier has planted hundreds of them along property boundaries and interior fences, next to cattle lanes and in the midst of pastures. Oaks and elms, cottonwoods and weeping willows, apples and apricots, walnuts and hazelnuts — Don has planted all of these and more during a grazing career that dates back to 1987. “Weed” trees volunteering along fence lines are allowed to grow if Don feels they’re serving a purpose. There is a bit of environmental science and operational efficiency behind this effort. Don notes that trees “slow the wind down and fix carbon.” Their extensive root systems accumulate large quantities of biomass that fix nitrogen, pump nutrients and help reduce soil erosion. “Planting trees is how we can really distinguish ourselves from the industrialized farms,” he adds. And with all of the pastures on his 200-acre dairy having at least some shade available, Don is able to keep his cows out to graze, drink and keep cool instead of moving them back and forth across this mile-long farm to a barn or shed. He likes not having to worry about the herd being stressed on hot afternoons. But there are larger reasons for the trees being here. Don is a fisherman and hunter with a lifelong love of nature. He says trees give the land character. “Trees make it a place. Otherwise, it’s just land,” he explains. Silvopasture is the modern buzzword for all of this, but Don was into planting trees long before it became fashionable. 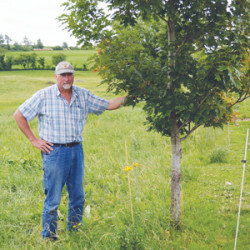 “Silvopasture is great, but I hadn’t heard of it when I started planting trees, just like I hadn’t heard of rotational grazing when I started doing it in 1987,” he explains. As a boy in 4-H, Don enjoyed nature projects involving trees, weeds, insects and wildflowers. After working a factory job for three years, he returned to the home farm and eventually bought the place in the early 1990s. He is the fourth Austin generation to manage this farm. Don and his wife, Kathy, raised three children who have grown up and moved off the farm. They babysit their grandkids from time to time, and Don enjoys fishing with them in their pond. A timber sale from the 12-acre woodlot his great-grandfather planted in the 1930s helped finance the construction of a New Zealand-style swing parlor in 1994. That same year he switched to entirely spring-seasonal calving, and in the late ‘90s Don transitioned to organic production. He has been shipping to CROPP/Organic Valley since 2001. Starting from a registered Holstein base, over the years he has added Jersey, Ayrshire, Milking Shorthorn and New Zealand genetics to the 80-cow herd. About half the farm is permanent pasture, and the other half is baled twice a year and grazed in the fall. He hasn’t planted corn since the early ‘90s, but he is rotating in some sorghum-sudangrass in renovating some alfalfa hayfields. His valley is crisscrossed by multiple streams that are fed by springs, with plenty of streambanks and wet areas offering management challenges. 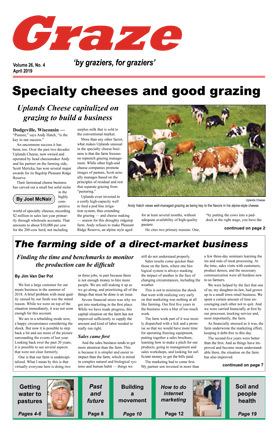 Don’s passion for planting trees in his pastures was ignited by an article in the New Zealand Dairy Exporter magazine about a Kiwi farmer who saw them as a great way to complement a grazing system. For Don Austin, the benefits of trees outweigh the problems they create. Don had always liked trees, but appreciated them even more when he started grazing. In terms of the peace of mind provided by his cows always being comfortable, “I think a shade tree is worth a lot of money,” he explains. Don was surprised at how easy it was to simply plant trees along the interior fence lines. To keep the cows away from trees along the fences, he cuts a piece of polywire and ties it to the main fence. He’ll make about a three-by-three foot square around the tree using two push-in fence posts. While fewer trees are in the middle of pastures, Don sees such plantings as restoring the oak savanna that dominated in this part of the world before the white man’s arrival. He has had success in getting them started by wrapping a home-made, flexible iron mesh cage, about three-feet high, around each sapling to protect it from the grazing cows and the mower. Survival is further aided by the fact that Don invests in semi-adult trees that are usually at least four to five feet tall. He’ll buy them on a whim when he’s out shopping. Don is always scouring books and magazines for ideas about different trees to plant. Trees planted in the spring need to be watered through the summer a few times, but if they’re planted in the fall they may only need to be watered once to take root and survive. 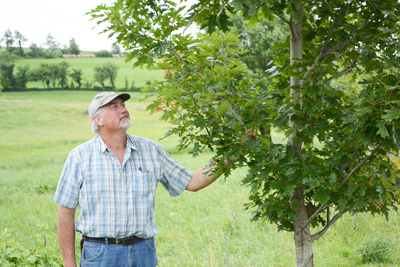 When planting within a pasture, Don prefers to plant the trees on a slope to better control water flows on the farm. When fully developed, the extensive root systems stabilize his slopes during heavy rains, an important attribute given his many streams and lowland areas. Don says the shade provided by a fully formed tree also protects the soil by preventing it from shrinking or cracking. There’s no science to where or what Don plants, but he knows his trees. He can point most of them out from afar, and has opinions on which species are the best. Don praises the hybrid poplars and the cottonwoods for growing straight and tall. The apple trees are among his and his cows’ favorites. Despite what he’s heard from others, eating mast — apples and nuts — doesn’t affect his cows. On the western edge of his farm one midsummer day, the cows were tucked into a tree line beneath some wild plums and a crabapple tree that provides beautiful flowers in the spring. Want something that will grow fast? “Plant cottonwoods,” Don suggests. Along his fence lines are cottonwoods planted in 2008 that already stand at least 20-feet tall. “They’re the most majestic tree out there,” he says, adding that they are big enough to cast both morning and afternoon shade. Volunteers are welcome here, too. The elms and oaks that used to cover the farm are slowly dying off, and Don appreciates any volunteers that may pop up. A wide variety of species, from choke cherry, to mulberry, to apple and boxelder grow randomly. “I go along and I’m weed whacking (underneath the electric fence), and I just decide to let some of them grow,” Don explains. While many are appreciated, others can be a hassle. Mulberries aren’t very sturdy, and the choke cherry is soft and short-lived. Trees create complications, of course. Don is vigilant about monitoring fence lines. He patrols them after each storm, chainsaw at the ready. He prunes some trees, especially volunteers, as they mature to reduce fence interference. Cows gathering under trees also create potential for mud and manure accumulation. Don says mud problems are minimized by the fact that he is rotating to new paddock areas after the nightly milking. Planting trees atop a ridge or along on a slope helps combat manure accumulation because rain should wash it away to prevent the area from turning into a swamp. “If it’s really hot the cows may go to the stream. Otherwise they’ll go to the trees, and it’s not hot and sunny every day,” Don adds. And when cows do muddy-up an area, he moves the break wire to force them into a different shady area. Don notes that the taller trees cast moving shadows that keep the cows revolving around them throughout the day. Over the years the farm lost some trees to storm damage, so Don built a pair of 10-foot tall shades that allow the cows to walk underneath. These are moved around the pastures with a skid steer. Trees also play a winter role here. The woodlot planted by great-grandfather provides an excellent windbreak during the worst winter days, while other fields destined for renovation the following spring also offer good protection. Overall, the farm is a result of Don’s desire to encourage a natural environment. The northwest corner features a six-acre Conservation Reserve Program area planted to trees for a wildlife food plot. A wide array of wildlife flocks to his farm. “Squirrels, birds and of course deer — even coyotes like to eat apples,” says Don. Turtle, mink — even a river otter — show up in the wet bottoms. In the meantime, he’ll keep experimenting with trees. In the lowlands Don recently planted a dawn redwood, a tree found in the mountains of China that was once thought to be extinct. It’s supposed to grow well in wet ground and reach 200 feet tall. That, Don figures, will provide some interesting shade. In other words, trees, forage and livestock are incorporated into one farm system that benefits all three. Silvopasture can provide higher-quality annual grazing and, if desired, long-term revenue from the lumber. The practice dates back centuries and is commonplace on the Iberian peninsula, Scandinavia and the pine plantations of the southeastern United States. Its popularity is growing, both in practice and in research. Silvopasture is meant to reclaim the land and mimic more natural, inherently sustainable landscapes, specifically a savanna ecosystem that includes both trees and open areas. Implementing silvopasture requires knowledge of trees and cattle, and farmers may need to reach out to agroforestry specialists or government resources to establish a well-planned transition. 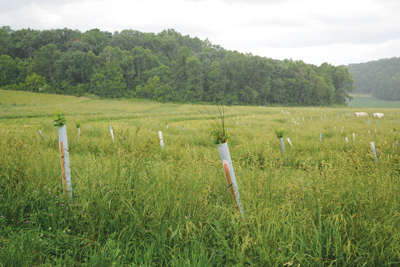 It can be achieved in two different ways: Woodlots can be thinned and pasture established, or trees can be planted to established pasture by planting seedlings or older trees. Both methods require adaptive planning, intensive management and patience. Research points to spacing that provides 30-70% canopy cover. It appears that the best choice is young/more fully-grown trees to achieve uniform shade. Seedlings are cheaper and much easier to plant, but they’ll require protection and time to grow. Older trees are more expensive and more work to plant, but they’ll pay off sooner and require less maintenance. Silvopasture offers several benefits. Perhaps most important, trees provide shade to combat heat stress in livestock. They create an evaporative cooling effect that decreases local air temperatures. They greatly reduce reflection of sunlight. Trees protect against water and wind erosion. Vast root systems sequester carbon and can kick-start hydraulic lift, which is where root systems redistribute water in the soil to partially protect against droughts. Trees stabilize soil nutrients and make the soil more resilient to ecological pressures. Shade will keep grass green during heat waves, and it can extend the grazing season a week or two in both early spring and late fall. Researchers are becoming more interested in silvopasture. For instance, a study in Missouri showed forage grown under a canopy had higher protein levels and lower fiber content than forages from a treeless pasture, although quantity did decline. Silvopasture does create some challenges. Establishment will take a lot of time, effort and patience in addition to the initial economic investment, which will vary depending upon scale and intensity. Silvopasture requires more intensive management than simply grazing because the farmer is juggling three different ecosystems simultaneously. A well-planned transition is necessary when converting to silvopasture. If managed poorly, the environment can be damaged in both the short- and long-term. The tree canopy must be contained to limit negative impact on forage growth and quality. Trees can be damaged by livestock or machinery during thinning or pruning, resulting in stunted growth. Wounds also increase the chances of pathogens damaging or killing trees. Tree protection is usually required, with options ranging from cheap electric fencing to expensive wire cages. Basic maintenance and labor are required. Pruning and tree trimming may be necessary as trees grow. Storms and old age will result in broken branches likely to affect electric fencing across the farm. Varieties of trees will attract wildlife, especially fruit bearing trees, which can spread unwanted seeds across the farm. Many fence lines can become marred in unwanted seedlings. Silvopasture requires intense management of forage, trees and cattle, and it needs to be a conscious decision. Simply letting animals into a forest or planting a tree can have negative effects on any of those three participants. Silvopasture’s sustainability starts and ends with a farmer’s desire and abilities. Jacob Marty’s tree plantings follow the contour of his field. Monticello, Wisconsin — Six generations ago, Jacob Marty’s family began clearing trees from this land in order to farm it. Some 160 years later, Jacob decided to replant trees onto some of that open ground. Silvopasture is part of Jacob’s plan to convert this former dairy farm into a multi-species, pasture-based enterprise that relies upon regenerative principles and working with nature rather than against it. At his Green Fire Farm, the goal is to produce grassfed beef and sheep, along with pastured pork and eggs, while attempting to replicate the perennial habitats that once covered this land. Jacob named his farm after the color of the wolf’s eyes that inspired the career of famed naturalist Aldo Leopold, a story told in A Sand County Almanac. Jacob launched Green Fire Farm in 2015 and immediately began converting row-crop ground to pasture. Then last year he planted a thousand trees in rows across 10 sloping acres. The ultimate goal is to finish his pigs — already corn- and soy-free — on fallen apples and chestnuts. Creating a more natural production habitat also works into his plan for adding an agritourism aspect to the farm. Through grants from USDA’s SARE program and collaborative work with the Savanna Institute, Jacob purchased and planted the trees lengthwise in sections. Specifically, these plantings were done in a loose “NAP” formation — first a nitrogen fixer, then apples, and then a pear, plum or pollinator. With 45 feet between the rows and seedlings every 10 feet, Jacob’s goal is to jumpstart a succession back into an oak savanna ecosystem. The configuration is designed to allow enough spacing for animals and trees to grow in tandem until they can reap the fruitful rewards of the trees. At the start of each row and every 50 feet thereafter, Jacob planted a canopy tree like an oak, basswood, pecan or chestnut. In between Jacob planted a mix of redbud, apple, pear and plum trees to keep the rows somewhat varied. The redbuds were included to act as the primary pollinator and add a beautiful flowery aesthetic. The apple trees will also provide some pollination, and the pears and plums will bear fruit for animals and agritourists to enjoy. The trees are in a keyline design on the contour of the land. The keyline concept aims to maximize water resources by slowing, soaking and sinking the water as evenly as possible. Some of the trees grew to six feet in the past year, and in five to 10 years Jacob hopes to have 15-foot oaks and productive chestnut and semi-dwarfing apple trees peppering his paddock. Only pigs and sheep are currently grazing amid the trees, as the farm has enough pasture to allow the cattle to graze elsewhere until the trees are large enough to avoid damage. Still, the young saplings require some protection. As part of his SARE grant, Jacob is testing different tree protection methods. In the first year he’s recognized that a sturdier, PVC-type casing works better than flimsier plastic coverings. Jacob says that if pigs and cows were in the trees at this point he would employ reusable (but expensive) Arbor Shield barb wire cages. With just the pigs and sheep grazing, Jacob can easily fence a paddock within the 45-foot spacing, thus keeping trees away from the animals for now. He will let the animals graze right up to the trunks of the trees when they are mature enough. So far there hasn’t been much maintenance involved, and survival rates are better than he had expected, with no more than 25% of the trees destroyed by storms or animals. Jacob had planned on doing more mulching and weed management, but has instead opted to let the taller grasses take up the moisture and act as a natural mulch that feeds the earthworms and soil microbes that will help heal his soils. Dylan Paris was raised on a grazing dairy in southern Wisconsin. What are fatty acids, and why are they important?